Capable of heating up to 1,800 square feet, the Tiburon produces up to 44,500 btu. The hopper on this stove will hold 52 lbs. of wood pellets and it can burn for 39 hours on one fill. The convection and combustion fans in this stove both run from one motor, which has the advantage of quiet operation and extremely low electrical power consumption, (27 watts). Battery backup is built in to the Thelin Tiburon - all you need is a twelve volt power lead and a deep cycle battery. The battery will automatically be trickle charged. A thermostat is available as an option. Heating Area Up to 1,800 sq. ft.
Max. Heat Output 44,500 btu. Automatic Ignition Yes, see comments below. Window Size 10 in. by 6 in. Rear Vent Height 10 ins. Battery Backup Yes, a battery connected to this stove is automatically trickle charged. Five years for heater cabinet and body. One year for electrical components and auger system. 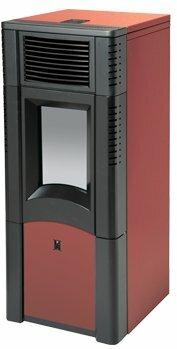 The Tiburon allows the owner to change the style of this pellet stove quickly, using only simple hand tools. Different grills are available for the front, ceramic or natural stone front lower panel inserts can be changed, and the colour of the stove body can also be changed to suit your decor. Automatic ignition will not function when running on twelve volt supply. In a neat bit of design, the combustion and convection fans both run directly from the same motor with blades of different pitch. When running on a twelve volt supply, the stove will not ignite automatically if the thermostat shuts it down. It must be set to cycle between high and low. Weekly: Clean out the stove and hopper with an ash vacuum. Clean the viewing glass. Clean the exhaust fan blades and the heat exchanger. Clean the air intake fan guard. Monthly: Check the clean out tee and the venting for a build up of fly ash. The 'Tiburon' has a 'clean' setting which uses its fan to clean the combustion housing and the fan blades making this very easy.